Features convenient bottom compartment with locking handle and 2 cylinder-locked top drawers for security of tools and supplies. Measures 23" W. x 20" D. x 51" H. Rolls easily on 5" casters. Gray enamel finish. FOB Shipping Point. Provides increased storage area for a variety of uses. Caninet door has "T" handle with built-in lock and keys. 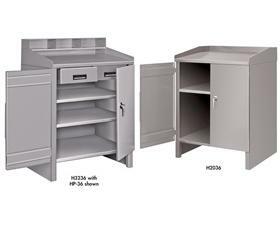 Inside cabinet measures 32"W. x 28"D. Measures 34-1/2"W. x 30"D. x 53"H. Tough gray powder coat finish. Ships Class 70. FOB Shipping Point. 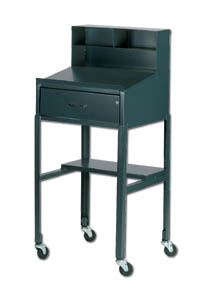 Provides a convenient writing area without using valuable floor space. Wall mounted brackets included. 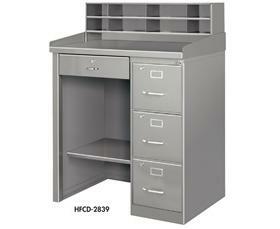 Measures 34-1/2"D. x 30"D. x 32-1/2"H. Tough gray powder coat finish. Ships Class 70. FOB Shipping Point. 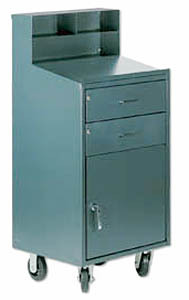 Features sliding drawer with cylinder lock for securing items. 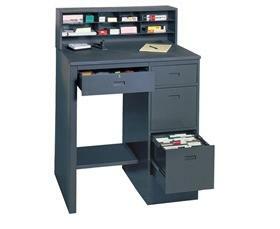 Measures 23" W. x 20" D. x 51" H. All-welded durable construction. Furniture grade baked-on enamel finish. FOB Shipping Point. 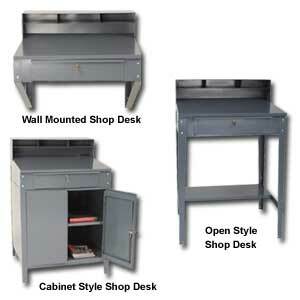 A) <STRONG>Open Style Desk</STRONG> - Features roomy drawer 24"W.x 22"D. x 4"H. and supplied with a cylinder lock. Gray finish. 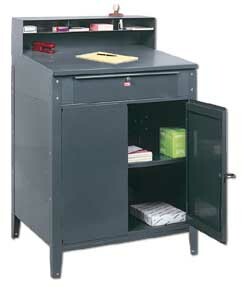 Shipped KD.<BR><BR>B) <STRONG>Cabinet Style</STRONG> - Same features as above, but fully enclosed desk provides extra space and added security. Heavy duty all welded construction. Roomy locking drawer measures 24"W. x 22"D. x 4"H. Large cabinet with easily adjustable shelf, three point locking handle with full piano hinges. Gray finish. FOB Shipping Point. 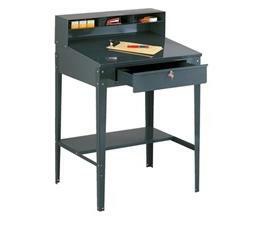 <BR><BR>C) <STRONG>Portable Cabinet Desk</STRONG> - Same as above but with 4-5" solid rubber casters, all swivel with brakes. Gray finish. FOB Shipping Point. 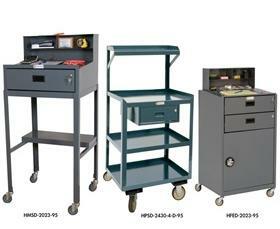 Includes 2 double deep file drawers with knockouts for optional cylinder locks. Box drawer for extra storage capacity. 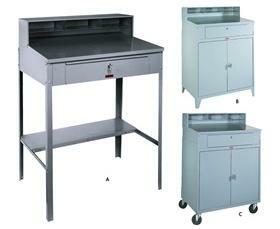 Features deluxe bi-level 8 compartment sorter. 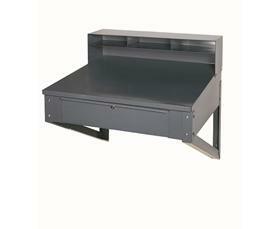 Easy sliding tray drawer is furnished with cylinder lock and 2 keys for secure storage. 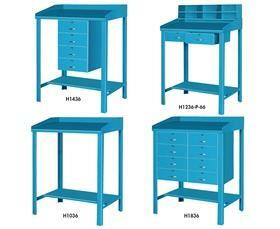 All welded 3 drawer pedestal ships set up. Measures 39"W. x 28-3/4"D. x 55-1/2"H. Tough gray powder coat finish. Ships Class 125. FOB Shipping Point. Desks can be stationery or mobile. Locking swivel casters <STRONG>(-R)</STRONG> and&nbsp;leveling glides <STRONG>(-G)</STRONG> are available. Choose from a single or&nbsp;double top&nbsp;compartment for increased storage. 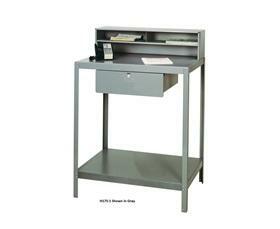 All&nbsp;desks include a heavy bench drawer that runs on ball bearing slides and has a sliding insert tray and cylinder lock. Drawer dimensions are 20 x 20 x 6". Change the product no. to <STRONG>H176</STRONG> for a larger drawer size 32-3/4 x 23-1/2 x 4". 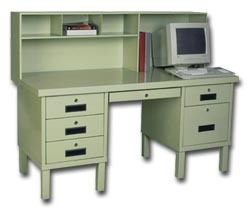 Overall&nbsp;desk size is 36 x 24 x 42&#148; to desk height; 51&#148; O/A height. Standard color Gray or Green &#150; please specify. Additional colors available &#150; call for information. Ships KD. FOB Shipping Point.